There are many different types of pies but pecan pie for some reason is favorited by many. 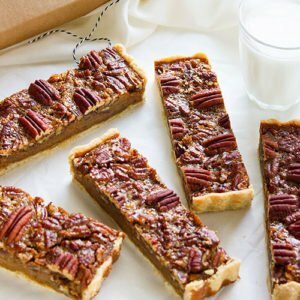 It could be the toasted crunchy pecans or the custard filling, maybe the buttery flaky pie crust, in reality, the combination of all three makes the perfect pie that you would enjoy or share with your loved ones. Most pecan pie fillings have corn syrup but I have replaced it with two ingredients that not only taste good but are good for you. 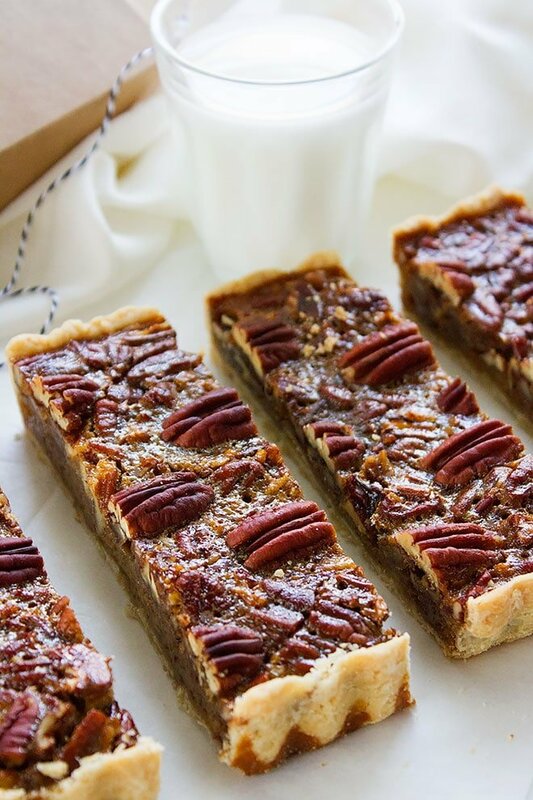 These two ingredients are my twist to this pecan pie bar recipe. I have used Honey and molasses. 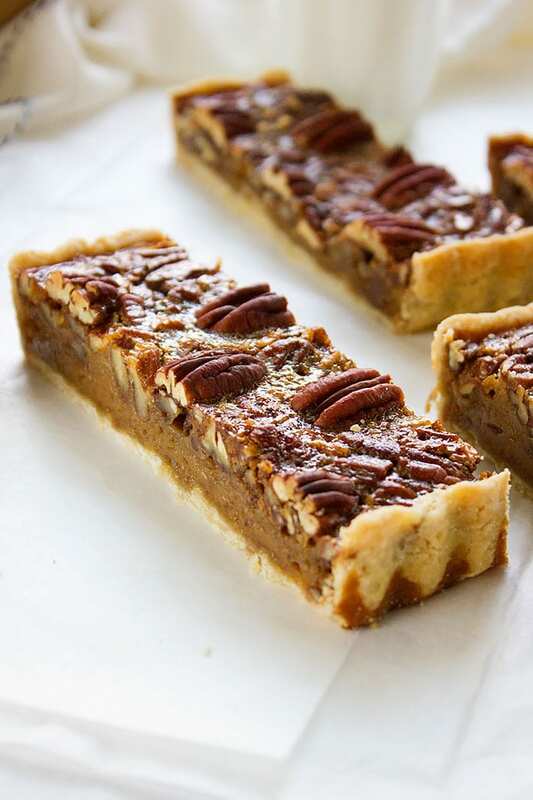 I have used the best ingredients to make these pecan pie bars, and the crust alone tastes like a fine shortbread. 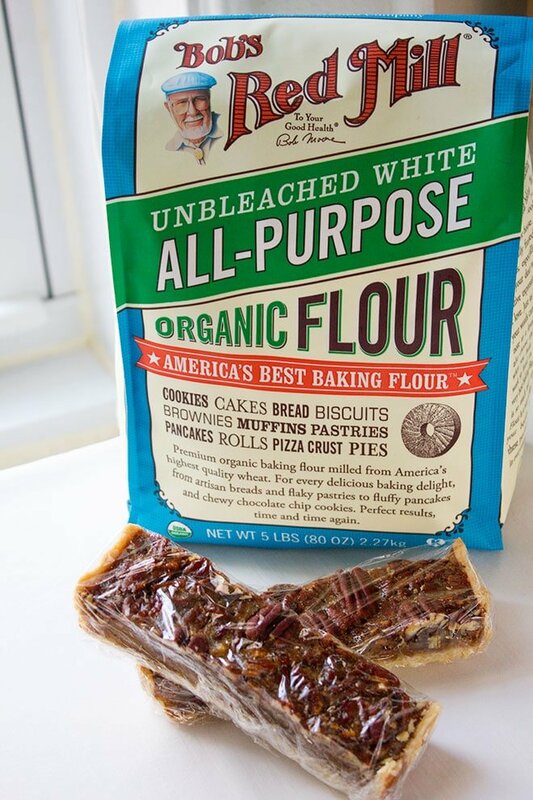 To make this amazing pie crust I’ve used Bob’s Red Mill Organic all-purpose flour. You can taste and see the difference when baking with high-quality flour. 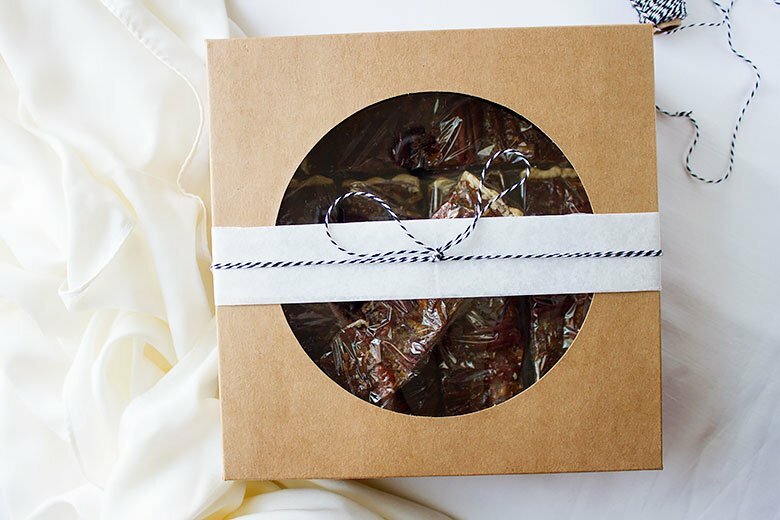 These pecan pie pars are easy for you to giveaway as a gift. I have individually wrapped each bar in a plastic wrap and I was happy to share these delicious delights with my family. 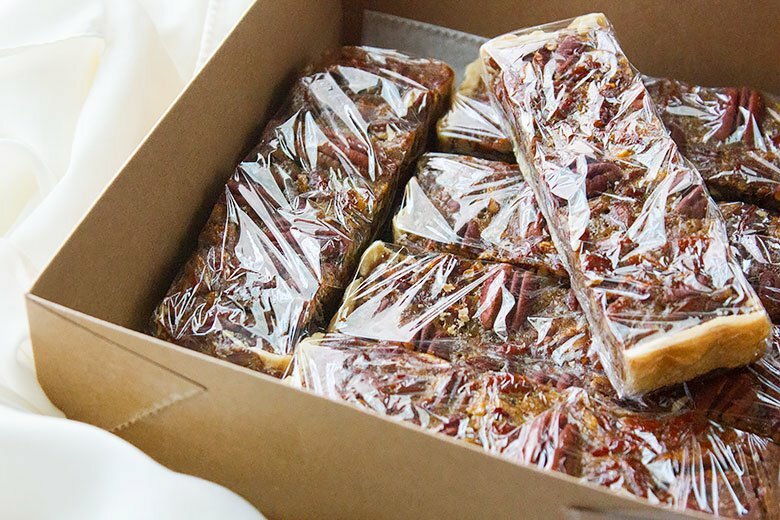 You can gift these bars to the less fortunate, make their day by surprising them with homemade and freshly baked pecan pie bars, which I’m sure they won’t just enjoy but will highly appreciate. It is easy to convert this recipe to gluten-free by using Bob’s Red Mill gluten-free baking flour. Add more water to the dough (a tablespoon at a time) or add a medium size egg. To roll the dough evenly place parchment paper under and on top of the dough and roll it into the shape you desire. 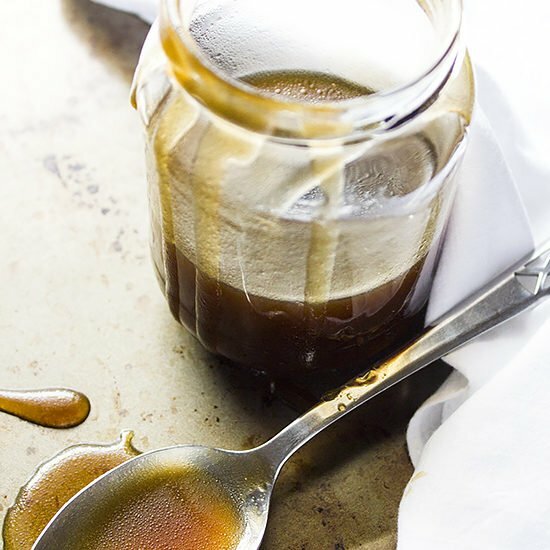 You might be hesitant to use honey in this recipe but do trust me, the texture and the flavor are amazing. I hope that you give this recipe a try and don’t forget to share the love! One more thing, you can get $1 off when buying Bob’s Red Mill product just click here. Tip: Place the pecan pie in the fridge after it cools down completely. Use a sharp knife to cut the bars. Make sure to cut equal size bars. Immediately, wrap with plastic wrap and place back in the fridge until it’s time to eat or distribute. 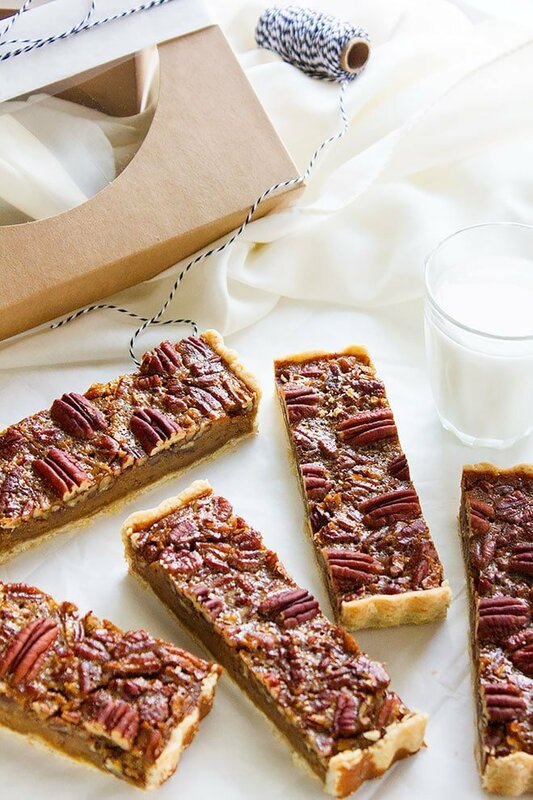 Indulge in this amazing dessert, pecan pie bars. Make some and gift it to your loved one, it will be highly appreciated, I promise! In a bowl, add all the ingredients except water. Rub ingredients together until you get a wet sand-like texture. Add the chilled water, do not knead the dough but bring it together to form a ball then press it down to make a desk. Dust working surface with flour. Roll out the pie crust to fit your baking pan. (the dough can fill a 9” pie pan or a rectangular tart pan). Fold the rolled dough in half. Transfer to baking pan. Unfold the pie crust and fit it in the baking pan. In a preheated oven of 350F/180C, bake the pie crust for 8 minutes. (you can place parchment paper on the pie crust and then place some weigh like dry beans, this will stop the pie from puffing. But you can place the pie crust without the weigh in the oven, bake for 5 minutes and by using the back of a spatula tap gently where the pie crust is puffed and it will become even again. Remove the pie crust from the oven and start making the filling. Preheat oven to 350F/180C. 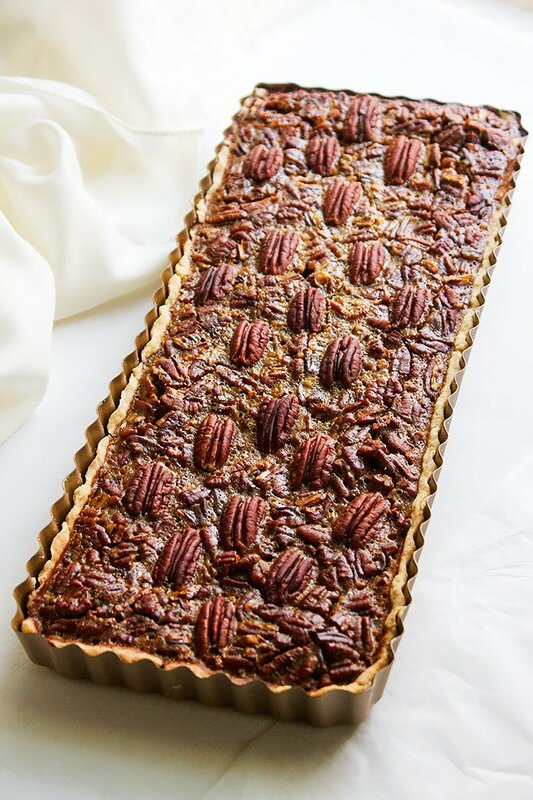 Place the pecan on a baking sheet and bake in the oven for seven minutes. Keep aside. In a saucepan, add the butter and flour stir until the butter melts. Add the sugar, honey, molasses, and salt. Stir until combined. Now add the milk and keep on stirring. When the mixture comes to a boil, turn off heat immediately. Add the vanilla, mix well. Gradually add the mixture to the beaten eggs while whisking the eggs to avoid scrambling the eggs. Add the chopped pecan to the pie crust and pour the filling mixture. I have used 19 whole pecans to decorate the surface of the pie. Bake for 45 minutes in a 350F/180C preheated oven. **This is a sponsored post written by me on behalf of Bob’s Red Mill. Perfect. Beautiful presentation and I *LOVE* that there’s no corn syrup! How large is your tart pan?? Looks delicious!!! These were awesome and I am 100% sure that you’ll enjoy every bite. 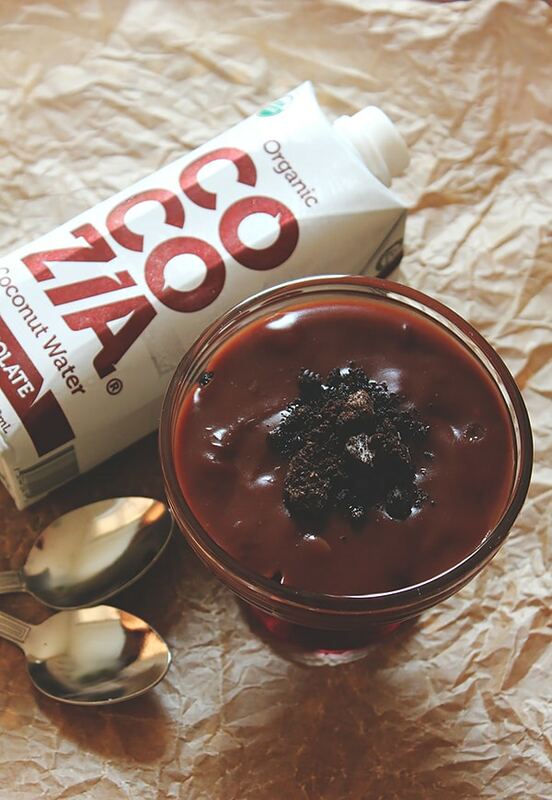 The taste is just heavenly!